The mainstream adoption of web-based applications, whether internally hosted, cloud hosted, or software as a service (SaaS), is transforming the ways in which enterprise-class applications are built, deployed, and consumed. While the evolution brings new levels of cost efficiency and flexibility, it also introduces new and unique visibility and control challenges for IT organizations, which must meet performance and user experience expectations in addition to basic availability. IT teams must adopt a two-pronged approach to meeting this challenge, combining performance visibility with proactive optimization technologies. 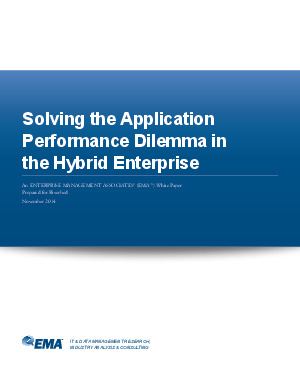 This ENTERPRISE MANAGEMENT ASSOCIATES® (EMA™) whitepaper examines the scope of challenges for assuring web-based and SaaS application performance, and reviews a solution offered by Riverbed that is designed to meet these new requirements.